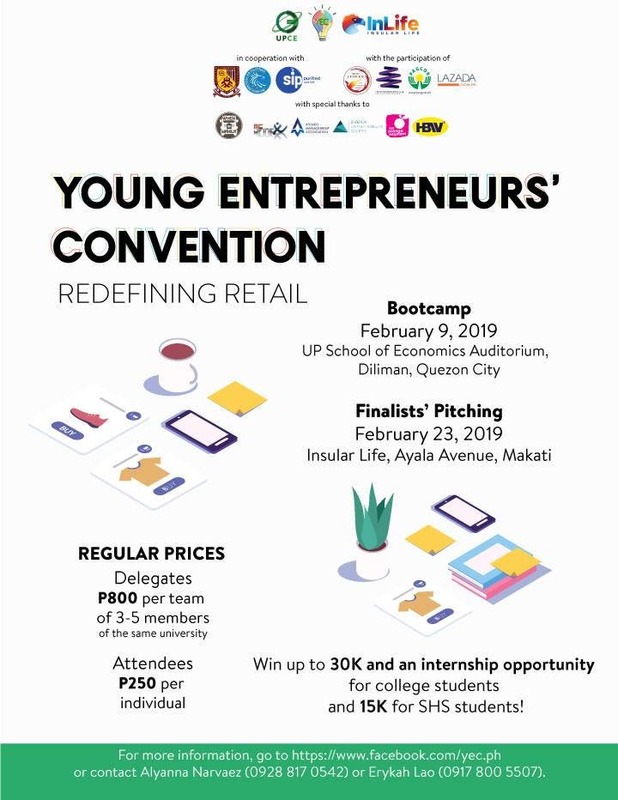 The UP Circle of Entrepreneurs proudly presents the Young Entrepreneurs Convention 2019: Redefining Retail. Join more than 260 senior high and college students as they learn the ins and outs of the trends and technology that drives the growing retail landscape in the Philippines. YEC 2019: Redefining Retail is a multi-stage business case competition. It starts on February 9, 2019 at the UP School of Economics Auditorium Diliman with a whole day workshop from 8:30 am to 4:00 pm. Students will be equipped with the necessary entrepreneurial skills given by our speakers, with topics such as entrepreneurship and e-commerce, marketing strategy, design thinking, product development, and business plan making seminar. The selected finalists of will then pitch their ideas on February 23, 2019 at Insular Life, Ayala Avenue, Makati. YEC 2019 aims to be a platform for Filipino youth to develop their entrepreneurial skills through practical application, and advance their interest in entrepreneurship as a method in creating solutions to socioeconomic problems. We hope to see you there! Registration ends on February 8, 2019. Sign up now at www.facebook.com/yec.ph and join us in Redefining The Future!